"The pain of discipline is nothing like the pain of disappointment"
What is the most plausible explanation for the fact that Australian national cricket team is enjoying the thrill of victory while its rivals are suffering the agony of defeat? 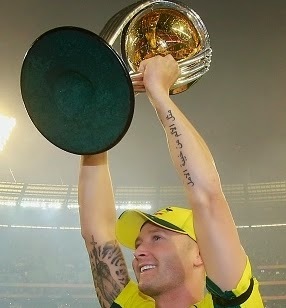 It can be found tattooed in Arabic on Australian Captain Michael Clarke's raised arm holding the ICC World Cup 2015. It's an Arabic proverb that translates as follows: The pain of discipline is nothing like the pain of disappointment. Discipline is what distinguished Australia from its competitors in all departments during ICC World Cup 2015: Batting, Bowling and Fielding. And discipline doesn't come easy. It takes a lot of hard work to develop and maintain the discipline necessary to effectively compete and win. There were many flashes of brilliance and passion in Pakistani cricketers' performance at the World Cup. In fact, cricket greats like Lara, Ponting and Tendulkar all agree that Pakistani bowler Wahab Riaz's fierce bowling spell against Australian batsman Shane Watson was the most memorable part of the tournament. But these flashes of brilliance were overshadowed by the lack of discipline by Pakistani fielders and poor shots played by Pakistani batsmen. Pakistanis' lack of discipline was obvious in several ways: Fielders dropped crucial catches or failed to stop boundaries; Batsmen selected poor shots to lose wickets at critical moments. It all added up to a big loss to Australia in the quarter final. Other South Asian teams seemed to suffer from the same lack of discipline when playing against Australia. Pakistanis' poor discipline on display at the World Cup is not limited to just cricket matches; it seems to be pervasive in almost all spheres of life Pakistan, a nation whose founder Quaid-e-Azam Mohammad Ali Jinnah frequently emphasized the importance of "Unity, Faith and Discipline". All of the talk of various TV talking heads, commentators and pundits on the causes of Pakistan's failures will do little to help Pakistan succeed, be it in sports or education or economy or any other area. What is needed is the return to the basics of "Unity, Faith and Discipline". Unity of purpose; faith in yourselves as individuals and as a nation; and discipline in all your pursuits. UNDER normal circumstances, a visit from Zimbabwe, the world’s lowest-ranked Test side, is not a prospect to make cricket fans’ lips smack. But last week, when Hamilton Masakadza marked his guard at the Gaddafi Stadium in Lahore to face the opening ball of their series in Pakistan, the crowd’s anticipation had been brewing for six long years. Zimbabwe are the first international side to play in Pakistan since 2009—an eternal wait for a cricket-obsessed nation. Tours to the country were halted when that year the Sri Lankan team was subjected to a horrifying attack on their way to the same stadium. Islamic terrorists, equipped with AK-47s and rocket launchers, opened fire on the team’s bus, and that of the match officials which was following behind. Six policemen and two civilians were killed. As the players and umpires cowered on the floor of their vehicles for 20 minutes while the bullets flew, several received shrapnel wounds. If it were not for the bravery of the driver, who sped through a hail of bullets hitting his windscreen, things might have been even grimmer. The attack was particularly shocking because until then it was felt that cricket, one of the few unifying pleasures in a polarised country, was an unlikely target for terrorists. Afterwards, no team wanted to play there. Pakistan was forced to play its “home” international series in the United Arab Emirates. Even worse, it lost the right to co-host the 2011 World Cup. Most of the games that were scheduled to be played there went to India, the country’s bitter rival, instead. For good measure, India also beat Pakistan in the semi-finals. Some wondered whether Pakistani cricket could ever fully recover. In such circumstances, the arrival of Zimbabwe has been a huge boon. The tour is only to last a week, with two Twenty20 matches and three one-day internationals. Naturally, security has been tight. One estimate puts the number of guards assigned to watch over the tour at 3,500. The Zimbabwe players will see little of the country other the Gadaffi stadium, where all the matches are to be played and where they are also staying. Despite this, the Zimbabwe players, none of them world stars, say they have been blown over by the welcome from ordinary Pakistanis. For Pakistan itself, an uneventful tour off the pitch will be a step towards redemption. Shuja Khanzada, the home minister of the Punjab, describes it as a “test case”. “We are hopeful to prove our abilities for hosting and providing foolproof security to any international team,” he says. Cricket fans around the world should wish him luck. Played in Pakistan, the sport is like none other. With its fervent crowds, and its production line of frighteningly fast bowlers, mysterious leg-spinners and elegant batsmen, it has always seemed the most vibrant of cricket’s many homes. There are no signs that any of the big international sides are yet keen to follow Zimbabwe’s lead. But one thing seems certain: given the reception that one of the game’s minnows has received, should they eventually return, they can be sure of a warm welcome. “What has happened at times is that if you were dropped and you had an influential uncle then you’d phone him up and he’d interfere and try and get you back into the team. It’s very difficult when you have all that going on and the environment it creates is not a healthy one. Former England captain Geoffrey Boycott said on Monday Pakistani cricketers have always had raw talent despite having lesser access to good facilities but nepotism is weakening its roots and is causing instability. “What is important is that there is stability from the PCB chairman and the committee and that hasn’t always been the case in Pakistan and that hasn’t helped the players,” Boycott told PakPassion in an interview. “There’s usually been trouble at mill and I’ve always felt that if you were in the Pakistan team long enough you’d get dropped, reinstated and at some stage you would become captain, because at one stage everybody got a chance to become captain and that isn’t a recipe for success. You need to have stability behind the scenes and not have all this in-fighting going on in the background. What is happening behind the scenes is important for what happens on the field. Boycott also said that Pakistan’s rise in Test cricket despite being able to play at home was praiseworthy. “My view on Pakistan cricket has never changed going back to the days when I played. Pakistan has always had youngsters who come through and who nobody has ever heard of, but who have got raw talent,” said Boycott. Wahab Vs Watson: "Cricket at its Absolute Best"